This starter couldn’t be more simple to prepare or more vibrant in color. We used a mandolin for very thin slices, and we also found that the longer you allow the beets to sit in the vinegar and oil, the softer and more enjoyable they are, so perhaps prepare this a bit ahead of time. Toss beets with vinegar and olive oil. Arrange slices on serving platter and crumble goat cheese over top. Sprinkle fresh mint and sea salt on, and serve ! This recipe serves 2 to 4 as a starter. Great - I'm happy you're starting with something so simple. This one I can do and it looks very tasty. I'm not sure where I can get golden beets in my city but I'll consider it a challenge! Once again, beautiful, simple. Looks like a winner. We're working with beets over at the brand new Vegetable of the Month Club too! Me encanta las remolachas y este carpaccio se ve delicioso, jamás había visto las remolachas doradas ...., el combinado es maravilloso. so gorgeous... i'm making it this weekend! 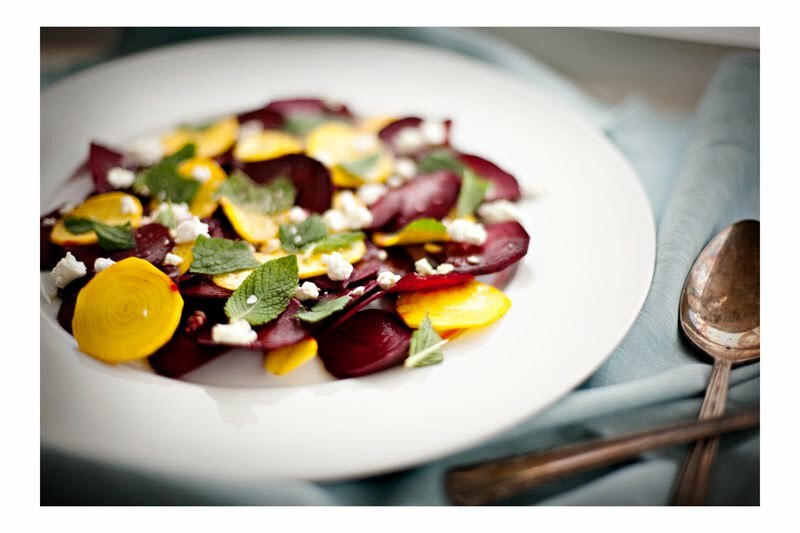 Your beet salad is absolutely stunning! Love it. proof that simple is best. The Color is exquisite! The Salad looks delicious! Would you like to be a guest chef/vendor at SS? All Photographs are Copyright of Karen Mordechai via Sunday Suppers. If you would like to feature our work on your website or blog, please Credit Karen Mordechai and Sunday Suppers. If you would like to inquire for commercial use and publication please inquire at info [at] karenmordechai.com - Thank you ! July 19 :: Moroccan Feast + Amy Atlas !